What more could a girl ask for? An elegant, sophisticated walk-in wardrobe. Perfect for people who are or want to be organized. The Metrica 2 has a proper space for everything you have. 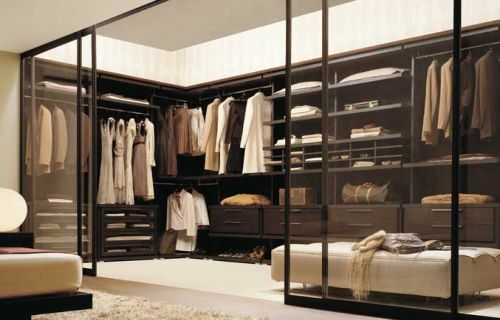 This wardrobe has specific placing for shoes, accessories, hanging clothes (according to length), drawers and then more! You may need to buy more clothes and accessories just to fill it up, doubtful…I know . But it gives you a good reason to go shopping . Misuraemme is a leading Italian manufacturer of high end wardrobe systems and looking at the Metrica 2, we can see why. The Metrica 2 is available in 4 types of wood; melamine, natural oak, oak brown, and sabbia. Made up of a combination of open and closed separate storage spaces, you can display your favorite or most used items and hide what you don’t want seen. This is a dream closet for any organized fashion conscious person. This entry was posted on Tuesday, April 22nd, 2008 by HDF and is filed under Storage & Organization. You can follow any responses to this entry through the RSS 2.0 feed. You can leave a comment.